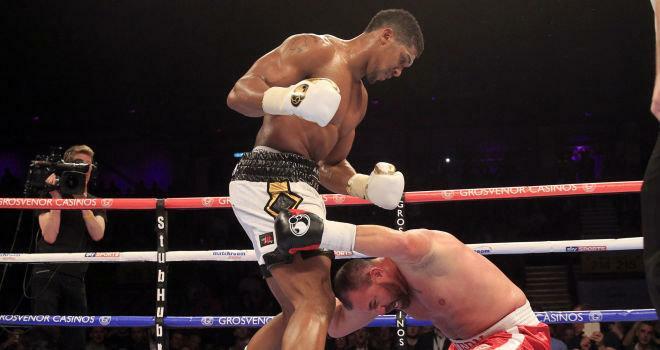 Anthony Joshua stopped the brave Jason Gavern in the third round to extend his record to 11-0 after a series of knockdowns forced the referee to halt proceedings. A hyped Newcastle crowd energized as heavyweight hope Anthony Joshua made his star-studded walk to the ring. Many couldn't see his opponent Jason Gavern lasting a round but the American does have plenty of experience and had previously mixed with elite opposition. Olympic-gold medalist Joshua used his left hand frequently throughout the opener and on two occasions, the jab itself put Gavern on his heels. Joshua also implemented his left hook that landed clean on several occasions, however the American's solid reflexes enabled him to step out of range and make his man miss. The Londoner continued to dominate proceedings in round two, however Gavern proved to be an awkward customer as his sharp movement and odd flurry kept Joshua's defensive ticking. The Olympic-gold medalist soon had his man on the floor, though, just after Joshua missed with a left he nailed Gavern with a brutal shot. The American complained it was landed at the back of his head but it appeared just to be a straight jolting punch. There was no need to continue complaining as yet another knockdown occurred. The dreaded right hand that Gavern had been doing his very best to dodge finally struck him clean on the chin. He staggered and bent over while Joshua unloaded with big shots and a solid left hook would send Gavern down once more. The American bravely made it back to his feet and showboated as an act of defiance but the Newcastle crowd rose in anticipation of a stoppage. It wasn't to be in the second, though, as Gavern held on with constant grabbing of Joshua. On the final bell, the American veteran absorbed another barrage of savage clean shots but a big "WOOOO!" sounded from him as he trotted in front of Joshua's stool to conclude the second round. If he was going out, it was with pure defiance. Joshua poured pressure on the already-battered Gavern with a barrage of hurtful punches on the ropes. A big, crunching right hand, followed by the left hook sent the American crashing to his knees, to which Joshua did land a shot while his opponent was down. After the knockdown, Gavern came out swinging. A wild right hook was dodged by Joshua but then it the Olympic-gold medalist himself swung but actually with a clean punch. The Londoner sent his experienced opponent down with a brutal right hand, followed by a left and that proved to be the final punch of the fight as Gavern, flat on his back, failed to make the count and referee Victor Lochlin stopped proceedings.